Derek Grant scored the first two goals of his NHL career, getting the second while the Anaheim Ducks scored three goals in a 97-second span of the third period during a 6-2 victory over the Montreal Canadiens on Friday night. Derek Grant didn't score a goal in the first 92 games of his NHL career, and then he put two past star Montreal goalie Carey Price. That was only perhaps the fifth-strangest occurrence in the Anaheim Ducks' 6-2 victory over the struggling Canadiens on Friday night. Grant scored during Anaheim's three-goal first period, and he scored again while the Ducks connected three times in a 97-second span of the third. In between, the Canadiens launched a stunning 30 shots in the second period at Anaheim goalie John Gibson, who made a franchise-record 28 saves. "It wasn't ideal," said Gibson, who finished two shy of the Ducks' single-game saves record with 49. "It wasn't how we drew it up, but we came back with a strong third period. I think that says a lot about us." Brandon Montour, Antoine Vermette and Chris Wagner had a goal and an assist apiece for the Ducks, who had scored just two goals in their previous two games before shredding one of the NHL's top goalies. Dennis Rasmussen also scored his first goal for the Ducks during the first period. "That's the best start we've had for our hockey club this year," Anaheim coach Randy Carlyle said. "We just want to play the right way, and I guess for 40 minutes, we played pretty good. The other 20, we need to work on." Paul Byron and Brendan Gallagher scored and Price made 39 saves for the Canadiens (1-6-1), who have lost seven straight during their worst start to a season since 1941. "I don't have an explanation," Montreal coach Claude Julien said. "All I know is it's not acceptable. We've showed how we can play, but we are not capable, so far, of doing it for 60 minutes." One game after Montreal yielded four goals in the third period of a loss at Los Angeles, the Canadiens allowed Anaheim's three-goal flurry in the third. Montour broke open the game with an exceptional one-timer from the boards after Kevin Bieksa's stick shattered on his own shot attempt, and Grant and Wagner added goals 23 seconds apart. 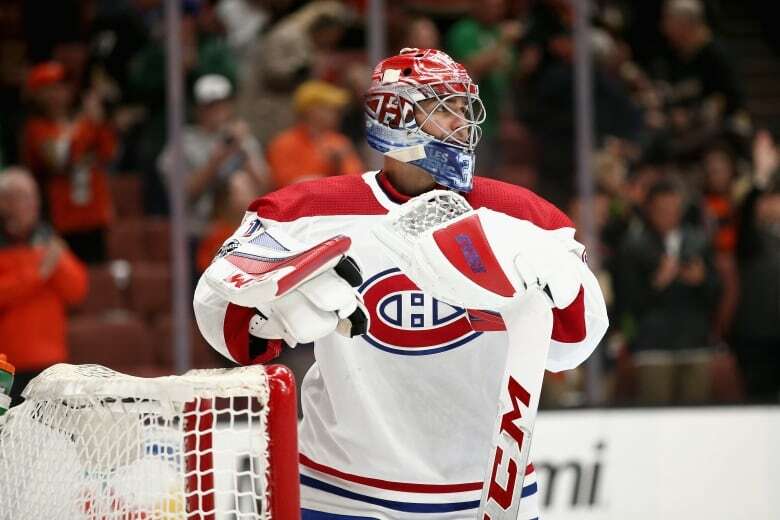 "I don't know a human on earth that wouldn't be frustrated at this point," said Price, who dropped to 0-4-0 in his career at Honda Center. "I think the biggest thing right now is to move on once we leave this rink." 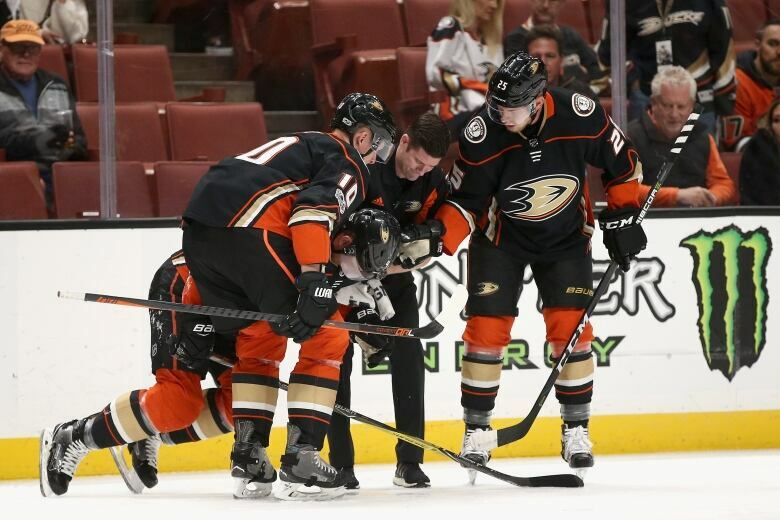 Not everything went well for the Ducks, who lost defenseman Cam Fowler in the first period to an apparent right leg injury. Anaheim's cornerstone blueliner was hurt when he went awkwardly into the boards with Phillip Danault's stick caught in his skate, and he left the ice unable to put weight on his leg. Carlyle said Fowler will be evaluated Saturday to determine the extent of his injury, but "hopefully it isn't [keeping him out] too long." Rasmussen and Grant, two veteran grinding centers, made the most of playing opportunities created by the injury absences of Ducks captain Ryan Getzlaf and Ryan Kesler. Getzlaf missed his third straight game with a lower-body injury, while Kesler is out indefinitely after offseason hip surgery. Grant, the 27-year-old veteran of previous NHL stints with Buffalo and Nashville, got his first career goal during the first period of his 93rd game. The Ducks also ended their 0-for-21 start on the power play, becoming the last team in the league to score with the man advantage. Byron and Gallagher scored on rebounds in the second, but Gibson broke the previous team record of 24 saves in a period shared by his predecessors, Jonas Hiller and Frederik Andersen.